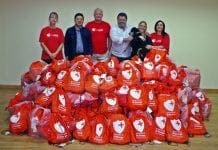 THIS year’s Olive Press Christmas appeal was for homeless charity Hogar Betania. Joe Duggan talks to some of the people who have been helped by the La Linea crisis centre. Gibraltarian Ronnie found himself living rough on the streets of Fuengirola as a 61-year-old. After serving four years in the British Army as a Royal Engineer, he embarked on a successful career in the tourist industry. He moved to Fuengirola in 1989 but, in 2011, the hotel he managed suddenly folded when it was discovered the owner had been paying bribes. With no family to turn to, Ronnie was left with nothing and ended up sleeping rough. Despite enduring traumatic hardships, Ronnie refused to be beaten. After two years of living hell, Ronnie happened to overhear two people in a cafe talking about Hogar Betania. He immediately reached out to Begoña. 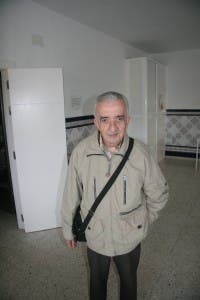 Hogar Betania have helped Ronnie find accommodation in La Linea, and he hopes to make his way back to Gibraltar, which he left more than 20 years ago. Hope survived a horrific two-year journey on foot from from her home in Nigeria before making it to Spain. En route to Libya, her group was abandoned by police in the desert. “I saw people dying on the spot from disease and from scorpion bites,” says Hope. After arriving in Libya, war broke out and Hope had to flee to Morocco. Once there, she was sold to a mafia gang. A member of the gang locked her up and abused her. “I was only able to escape when I became pregnant and he let me go,” she says. Desperate, she boarded a flimsy rubber raft before undertaking the treacherous crossing to Spain with 54 other refugees, including six other pregnant women. Saved at sea by the Red Cross, she was taken under Hogar Betania’s protection once she arrived in Spain. Traumatised by her ordeal, Hope didn’t speak for a month. Begoña and Manuel attended the birth of her child and helped care for Hope and her new baby. She now has a job and helps counsel other victims at the centre, and has learned Spanish and English. While at Hogar Betania she met her current husband. And in November last year, Hope named her second baby after Begoña. “I feel like the queen of Africa. I have two guardian angels looking after me when I was at the point of death,” she said of Manuel and Begoña. Luis came over to Spain in the summer while caring for his father. A personal trainer and keen musician, Luis came hoping to find work in La Linea, where his family are from, and learn Spanish. He hoped to build a new life in Spain, but struggled to settle into work. With personal problems at home forcing him to seek alternative accommodation after arriving in Spain, he turned to Hogar Betania. 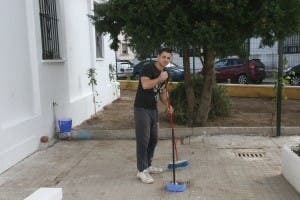 Luis is currently trying to find work in Gibraltar while helping out at the centre. Salif left his home in the Ivory Coast, where employment prospects were bleak. 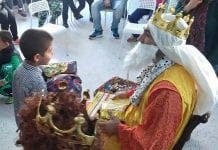 After a two-month journey to Morocco, he made his way to Tangiers. Pooling their scant resources, a group of migrants scraped together enough money to make a raft, which they boarded one day four in the morning. “The crossing was very hard and very dangerous,” he says. “People got hypothermia. I was terrified.” Around midday, their makeshift vessel was spotted in trouble off the coast of Tarifa by the Cruz Roja, who rescued them. Thankfully all of the occupants survived. But many who undertake that perilous journey are not so fortunate. Salif is now helping out with the refurbishment work at Hogar Betania, where all residents work in some capacity, and hopes to find work.